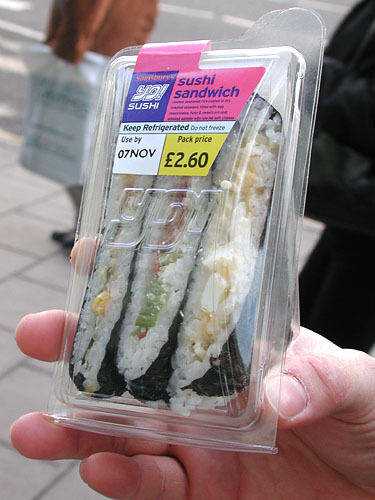 Londoners are sandwich-mad. Every market is stocked full of these triangular plastic containers with all sorts of sandwiches inside. Apparently some Earl of Sandwich invented it back in the 18th century. Well, sandwiches here mean these triangular pieces. No rolls, buns, bagettes in sight. The one pictured is an interesting twist on the whole triangle-sandwich concept.